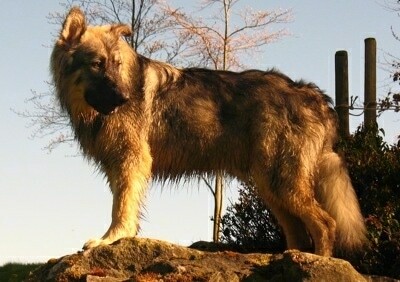 Hector the American Alsatian at one year old—"Hector was whelped at Schwarz Kennels in Oregon and now lives in Europe." The American Alsatian is a large-breed companion dog. Its coat is medium in length and can be either gold, silver, black sable or cream. Silver sable coloring is the most desirable. White or black sable markings are extremely rare. The eyes range from light brown to yellow and are almond shaped with a wolfish stare. The ears stand erect and the black-tipped tail hangs down touching the pasterns. The head and hips are broad with a strong, dark muzzle. The toes are slightly splayed and the bones on the leg are large and round. The chest is deep and the body is longer than tall. The American Alsatian is a great family companion dog. They are extremely loyal to their family members and accept children and other pets. The American Alsatian remains aloof to strangers, but is never fearful or aggressive. They are watchful and intelligent, learn quickly and will respond to the softest sounds. With the proper amount of exercise the American Alsatian is extremely calm and quiet, even when left alone for extended periods of time. They do not initiate play unless encouraged. This breed tends to have a low prey drive and activity level. They do not have a tendency to bark, whine, dig or run the fence. They respond well to light correction. Thunderstorms or gun shots do not bother them. Because the American Alsatian is very attached to its family, they readily choose to stay close to the comfort of home. Socialize well. Be sure to always be your dog’s consistent pack leader. In 2009, one dog had epileptic seizures. The founder is urging all owners of dogs from Beamer lines to immediately report any signs of epilepsy. No other health problems have been experienced since 2003, when two dogs experienced severe arthritis. The American Alsatian adapts well to many living environments. This breed does not require a lot of space. They do have thick double coats and do not like extreme heat. Be careful to keep these dogs cool in hot environments, giving them plenty of water and shade. The American Alsatian is calm and quiet throughout most of the day. 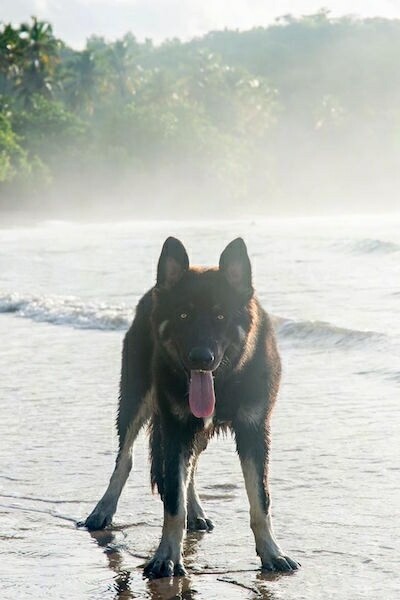 This breed does not require as much exercise as the German Shepherd but still needs a daily walk. They love to go for walks in the park, but are slow and lumbering when asked to work. They prefer the calm work of therapy dogs. An average of 12 - 14 years. The American Alsatian needs regular brushing around the ears and the backs of the legs. They shed dirt easily and their coats remain free from odor. Once or twice a year, depending on the weather, the American Alsatian will need to be brushed out when the undercoat comes loose and they start to shed. 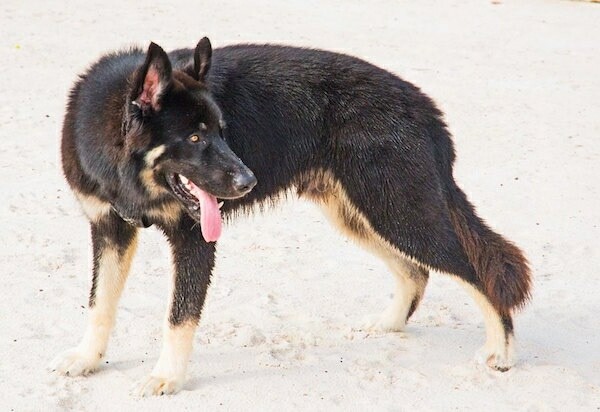 As of February 21, 2010, the official name of this breed has been changed from Alsatian Shepalute to American Alsatian. It was changed by the board and approved by the members. 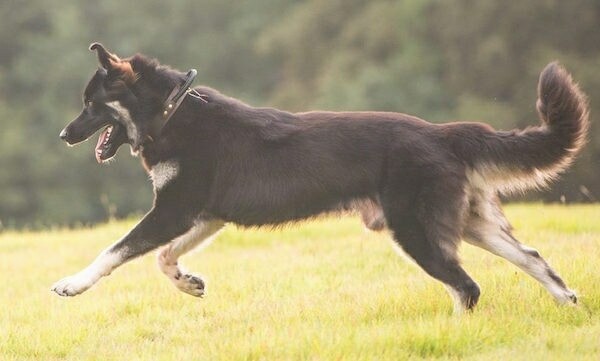 The first generation American Alsatian was registered in 1988 in the United States by the North American Shepalute Club (since renamed the National American Alsatian Club). 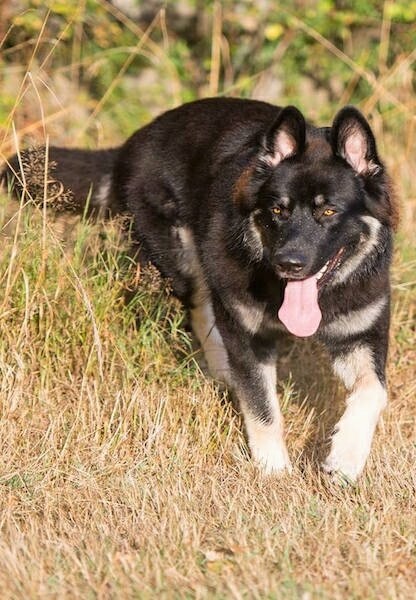 This breed holds five purebred dogs within its lines: the Alaskan Malamute, the German Shepherd Dog, the Great Pyrenees, the Anatolian Shepherd, and the English Mastiff. With over 20 years of selective breeding, only certain chosen pups were bred that possessed the desired traits of a family companion dog. The year 2000 was the first year that the American Alsatian was introduced to the American public, as they finally conformed to the breed standards set by the breed founder, Lois Denny in 1987. 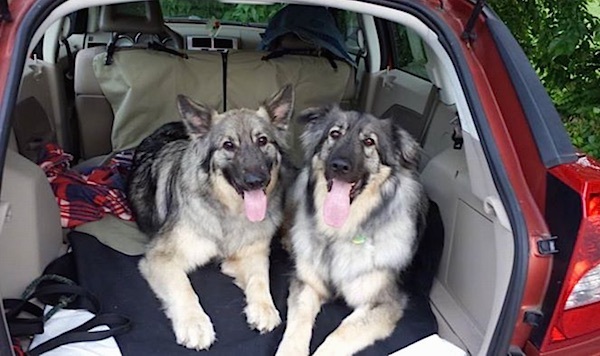 Khoshekh (left) and Maddy (right) the American Alsatian dogs at 4 years old—"Khoshekh and Maddy live in Nashville, TN and enjoy hiking, napping, and snuggles. They're very laid-back and friendly." Winter the American Alsatian eating raw mean out in the grass. He was whelped at Schwarz Kennels in Oregon, lives in Columbia, MD. Picture taken a day before he turned 9 months old. 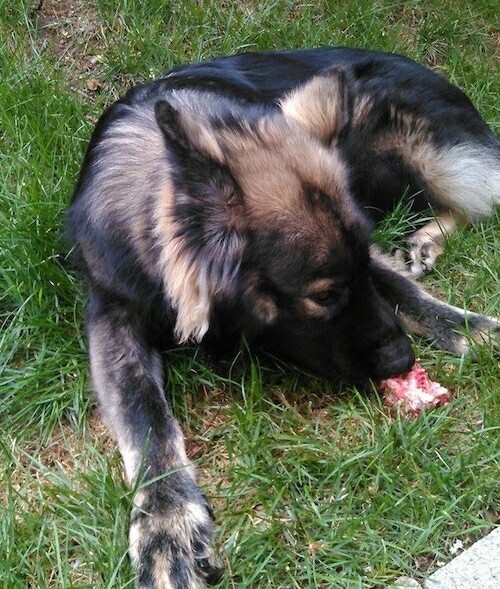 Winter the American Alsatian at 9 months old eating raw mean out in the grass. He was whelped at Schwarz Kennels in Oregon, lives in Columbia, MD. 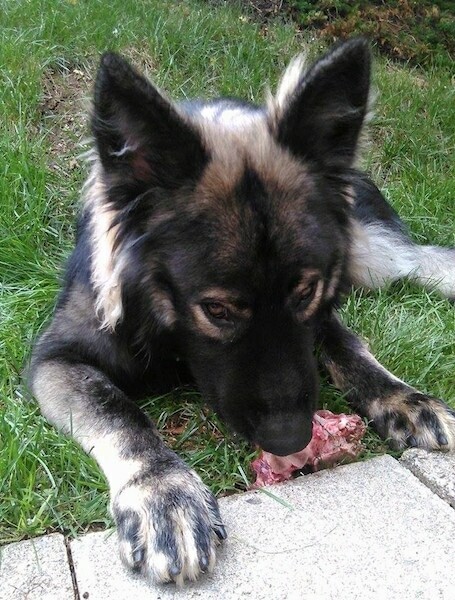 Winter the American Alsatian at 9 months old eating raw mean out in the grass. He was whelped at Schwarz Kennels in Oregon and lives in Columbia, MD. Winter the American Alsatian at 9 months old eating raw mean out in the grass. 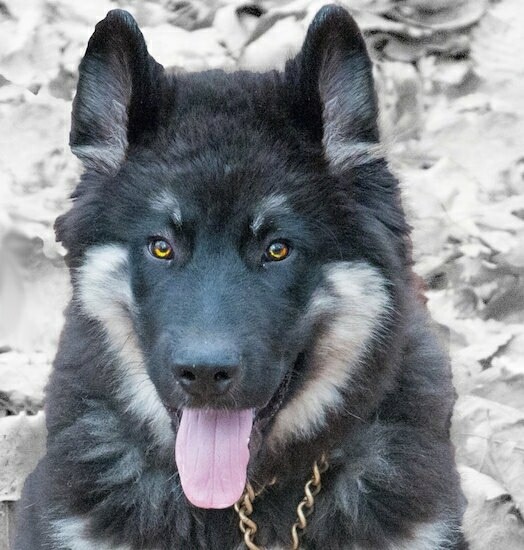 Bred by Schwarz Kennels in Oregon, lives in Columbia, MD. 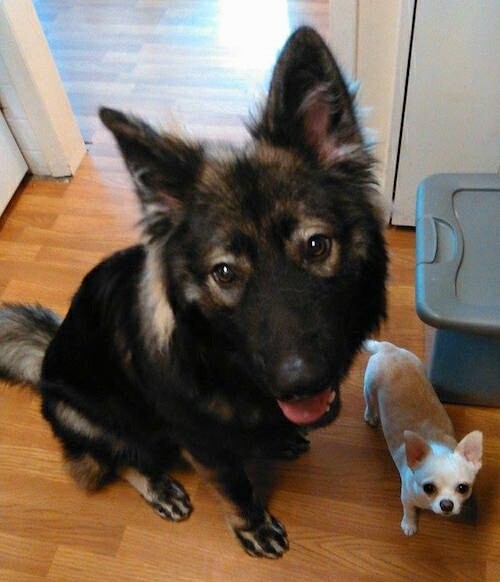 Winter the American Alsatian at 9 months old with his Chihuahua friend. 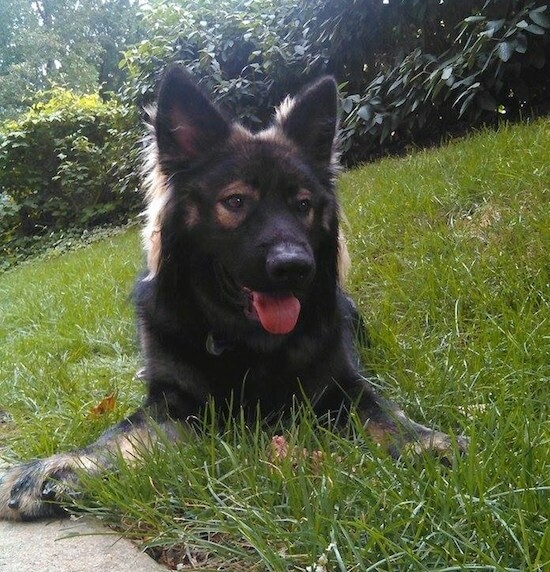 Winter was bred at Schwarz Kennels in Oregon, lives in Columbia, MD. "This is Jojo from Washington State at one year old. He is 120 pounds and stands 27 inches tall. He is in training to be a therapy dog." 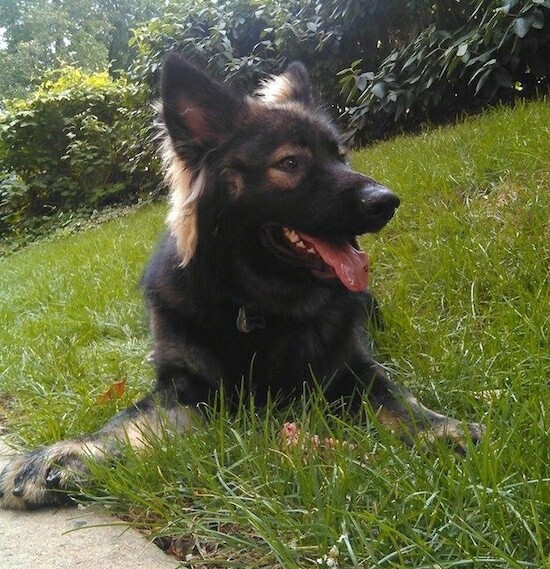 "Dear Prudence is a 10-month-old American Alsatian. 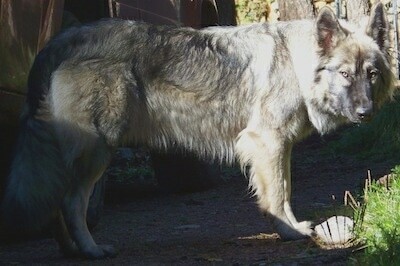 She lives at Vallecito Alsatians in the Colorado Rocky Mountains." 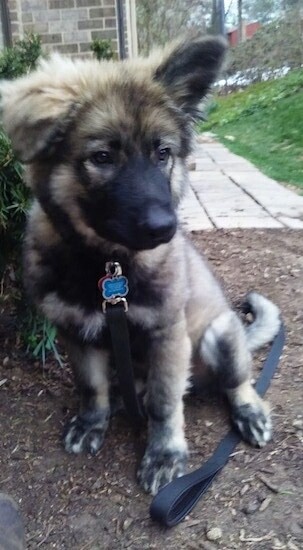 Winter the American Alsatian as a puppy bred by Schwarz Kennels in Oregon and now living in Columbia, MD. 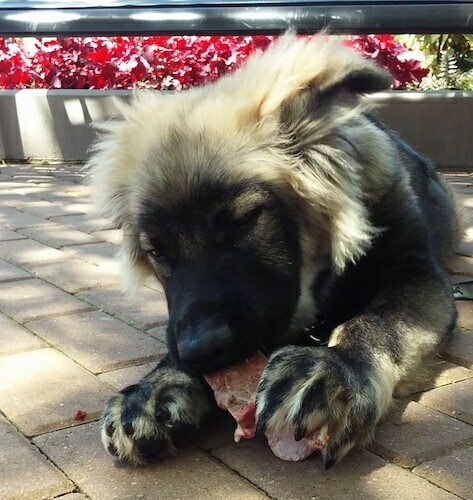 Winter the American Alsatian as a puppy enjoying his raw meat. 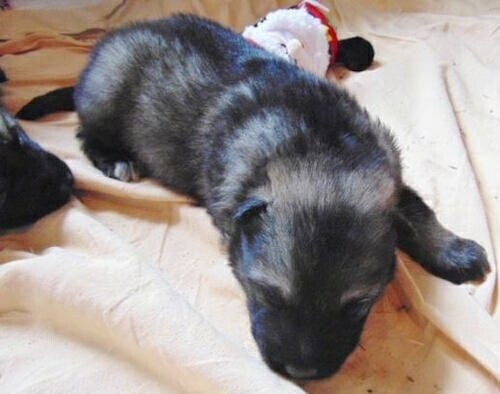 Winter the American Alsatian as a puppy bred by Schwarz Kennels in Oregon and now living in Columbia, MD. 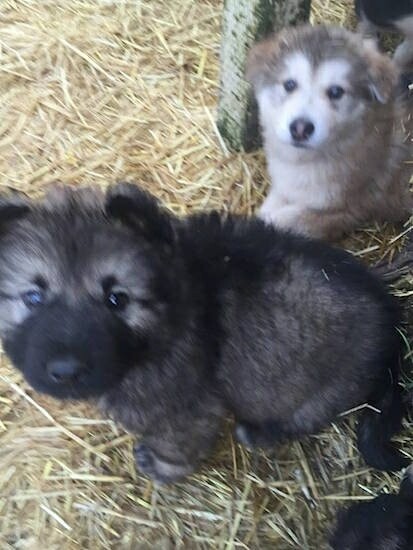 Shown here with his littermate behind him. 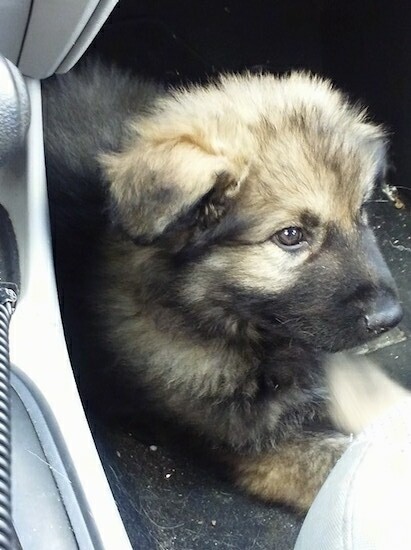 Winter the American Alsatian as a puppy bred by Schwarz Kennels in Oregon and now living in Columbia, MD. Shown here as a young puppy.